What a difference a year makes. An average finish of 18.8, 29th in driver points in a season marked by injury. That’s not very promising for a driver, especially one who’s a journeyman at best in his mid-30s. A year later, Aric Almirola finishes his season fifth in points, with 17 top-10 runs, a win, a pole and an average finish just south of 12th. While he missed the cut for the title race, Almirola rode a ninth-place finish to a four-point gap over Chase Elliott in the race for honorable mention. This year’s season finale really feels like an ending. The last few seasons have seen a number of drivers walk away, and this no exception. Matt Kenseth, Jamie McMurray, AJ Allmendinger and Trevor Bayne have likely seen their last days as Cup drivers come to a close. There might be a race here and there, particularly for Allmendinger, but really, it’s over. That’s no small thing for race fans. You can always pick another driver to pull for, but it’s never quite the same as it was with that one guy. 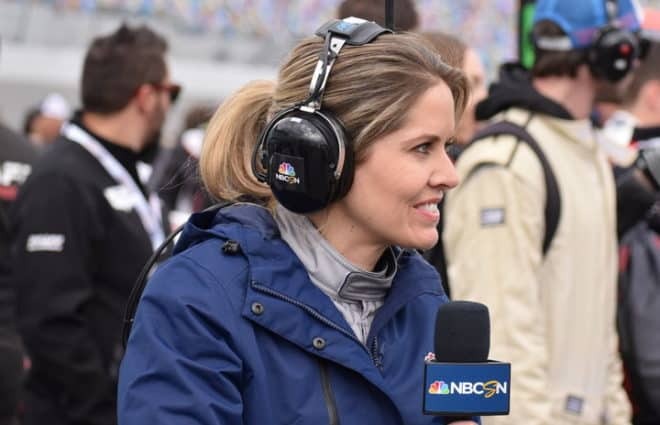 It may not be the sole reason or even the biggest one that interest in NASCAR has waned in recent years, but it’s hard to deny that it at least plays a role. The youth movement is here, and the future is bright, but those halcyon summers of that all-time favorite fade from the present. NASCAR too seems to understand that something vital has changed. Earlier this weekend, new president Steve Phelps said that change is on the wind for 2020. Phelps said that the sanctioning body will look at the tracks, the cars, even adding midweek races. Anything may be on the table, Phelps told media in Homestead. The one thing he didn’t mention was the elephant in the room, though: the title format that has “chased” away fans in droves the more NASCAR tries to make it fit the mold of other sports. It’s time to stop trying to shove square pegs in round holes and find some round pegs because they used to work just fine. Perhaps, just as everything changes, the simplest way to make things better would be to make things the same as they once were. It won’t bring back everything we long for, but it might be a start. On the other hand, even in an ending, there was something positive. As Jimmie Johnson bids farewell to longtime sponsor Lowe’s, whose backing brought him seven championships and more trophies than he can count, another, Ally Financial has seen enough value in NASCAR even now to back Johnson for two years, every race. That’s almost unheard of in NASCAR anymore, with full-season sponsors a dying breed. While Ally had the advantage of seeing how NASCAR sponsorship can work from the days when GMAC, the company Ally took over, was in the sport full-time, it’s still a bit of light in the darkness. 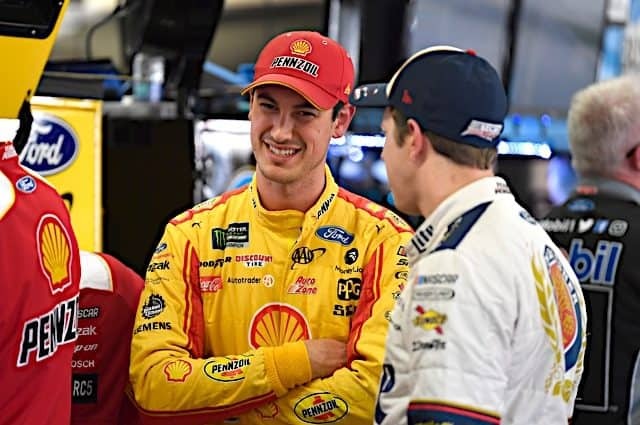 Where… did Joey Logano come from? Logano said going in that he had the field covered for 20 laps. Luckily for him, exactly what it came down to was a 15-lap sprint to the checkered flag. Never far from the front, Logano started the day fifth, but by the closing laps, he was in the thick of the championship battle. 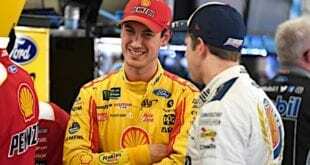 Logano entered the weekend on the outside of the Big Three of Kevin Harvick, Kyle Busch and Martin Truex, Jr., who combined for 20 wins on the season, more than half of the schedule. He ended it by outracing every one of them. When the late caution flew for Daniel Suarez, Logano restarted third, and that could have ended his night. 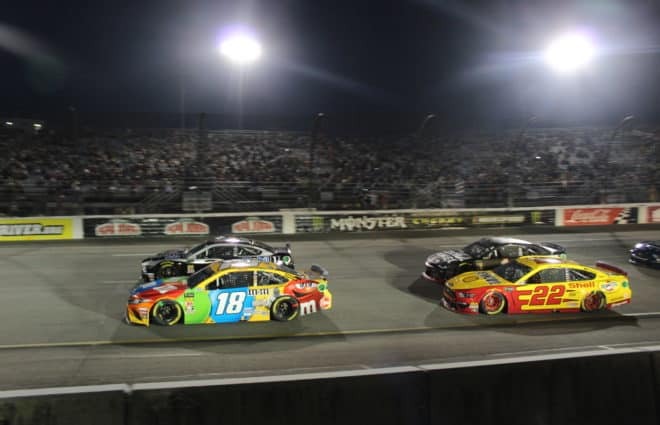 Instead, he was able to get by Busch quickly enough to keep Truex from getting away, and once he got to Truex, it was no contest as Logano made an aggressive move to the top of the racetrack for the winning pass. 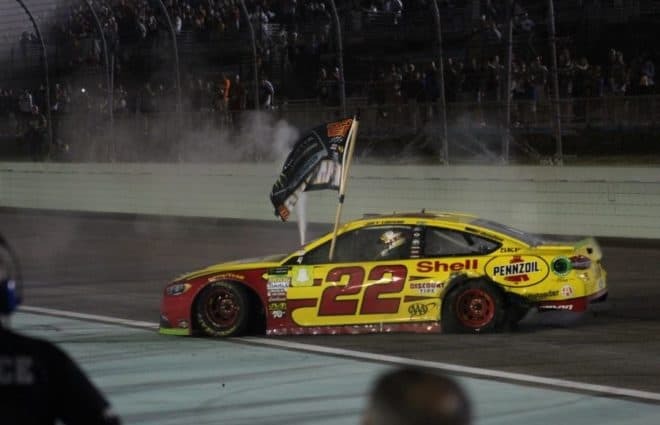 From there it was a matter of hoping nobody made a mistake to bring out the yellow again, and when that didn’t happen, Logano cruised to the win. He sent a message at Martinsville that he was willing to use his bumper for a chance at his first title, but in the end, he didn’t need it. The turning point in the race and the title came when Suarez slammed the wall in his final race for Joe Gibbs Racing. 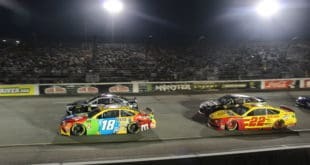 At the time, Kyle Busch was the race leader, but he needed a caution for any shot at the title. Short of fuel and on older tires than the competition, Busch’s title hopes were dwindling with the laps. Suarez’s crash gave Busch, at least briefly and conveniently, a shot. It also changed the complexion of the championship race completely. Had the yellow not flown, Harvick was third and gaining on Busch, who still needed to pit at any rate. Truex had pulled by Logano for what would have cycled into second place with time to hunt Harvick with a faster car. Without the caution, it would have been Harvick and Truex duking it out for the win and the championship. The caution, in all its television cliché glory, changed everything. Why… didn’t polesitter Denny Hamlin pull it off? Hamlin didn’t have the speed to compete once the sun went down. He looked good in the early laps, perhaps hampered by a secondary pit stall pick, but more so by the changing track. Hamlin and Kyle Larson, who both had early speed, faded with barely a whimper as the sun sank below the horizon. That gave the day to the title contenders. The four chasing the Cup were the top four when the checkers fell for the last time in 2018. That’s been the case consistently. Since the current title format began in 2014, every champion has also won at Homestead. That’s fitting, the cream rising to the top when it counted. But is that the only reason? Are the other teams willing to race the top four for a win in a race where a mistake would forever brand them as “that guy” who took out a title favorite? Are the title contenders, when it comes down to everything on the line, that much better? Prior to this format, it wasn’t uncommon for someone else to win the final race even as the new champion was taking his place. Now, not so much. How… come NASCAR didn’t put a stop to the team orders at Joe Gibbs Racing? Did pit box selection affect the outcome of the race? If Kyle Busch had had a better car, it would have, as it allowed Busch to come out of the pits with the lead on the final stop. As it was, Busch faded to fourth, lacking more speed than the pit stall could overcome. But how come NASCAR, which has said repeatedly that teams should give 100 percent to win and that team orders were a no-no allowed Hamlin’s team to give Kyle Busch, who qualified just behind polesitter Hamlin, the advantageous first pit stall? Joe Gibbs, Hamlin and Busch’s team owner, made no bones about ordering Hamlin’s team to give over to championship contender Busch. 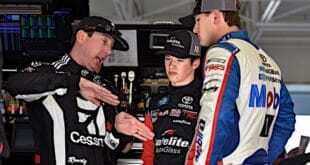 Hamlin made it pretty clear he wasn’t happy with the decision. The first pit stall is nearly always an advantage, especially so at Homestead, and Hamlin was trying to salvage a winning streak that has him visiting Victory Lane at least once each year of his career. There’s no way Hamlin’s team wanted that No. 4 pit box. And there’s no way NASCAR should have allowed the team, especially once Gibbs made it clear he made the call to take away an advantage from Hamlin in order to give it to Busch. 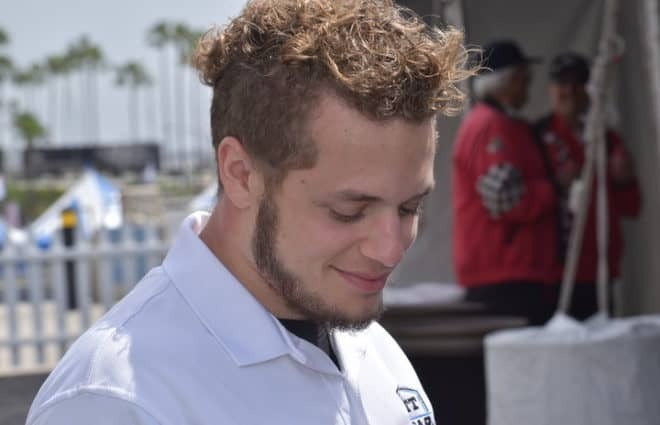 The fact that the move was allowed calls into question every move the championship drivers’ teammates make and whether it’s an intentional move to help win a title, even at the expense of a win for them. And the last thing NASCAR needs is more questions surrounding an already questionable title format. The pitsall story is so over hyped. Did it help the 18, some, but not nearly enough. This isn’t Martinsville or Dover where that stall is a huge advantage. The only reason this is a story is because a JGR team won the pole. They were just playing by the rules as written. Amy, Hamlin I believed still finished top 10 for fading with a whimper seems a little harsh. Also after missing his pit stall and having to restart 17th that was his down fall not the pit selection. Also, Larson also did not fade with a whimper he hit the wall and caused a caution with a flat right rear tire and was not in contention after that. It had nothing to do with the sun going down as up to the point of hitting the wall Larson was running just fine, catching the top 2 or even running second or in the lead and the sun had basic already set at that point. Sure seemed to me that Harvick’s pit stall work well for them most of the night. Nice call on the shoutout of the race with Amirola. Team totally did the unexpected most of the season. Also, goes to show the driver can prop up equipment or the equipment can prop up the driver. Both are needed. Case study might be coming next year with the 48. How will that team do? One might wonder if Suarez’s crash was just a racing deal. To look at https://twitter.com/NASCAR/status/1064296492737810432/video/1 , the #19 appears as a relatively innocent bystander, since the #38 seems to have gotten into the #2, which then got into the #19…the #19 spin might have been convenient for the #18, but I am not sure either of the Ford drivers in the #38 and #2 would follow any orders by Gibbs. First off the “crash” that gave Busch the necessary caution was Suarez getting spun off the 2 cars front bumper after the 2 car got either loose in the little pack racing for position at the time or pushed up the track into the 19. The 19 did not “Slam the wall” for this caution. Suarez did not spin intentionally. Wish the author would have actually watched the race or the replay of the 2-19 incident. One certainly cannot eliminate the possibility that the Suarez caution was manufactured for the benefit of those who needed a caution. Weekly short track racers are VERY familiar with the manufactured caution . . . . Given the high stakes involved, it’s surprising that more such team strategy isn’t employed. If the top 4 drivers occasionally end up ahead of the entire field, it’s a coincidence. every time, it’s not. Try to convince me that the ‘other’ drivers aren’t afraid of “interfering” in the title run. That is the big weakness in trying to have a ‘playoff’ with every team still on the field. Might as well have only had to top 4 on the track, especially since TV only managed to cover about 8 cars all night. The entire idea is pathetic. And for a ‘sold out’ race, I certainly saw a LOT of empty seats. It’s time for Nascar to rethink this idea that has to be like every other sport, when it’s nothing like any of them. That used to be what made it appealing. Some have indicated Larson conceded the 2017 race to the final four. 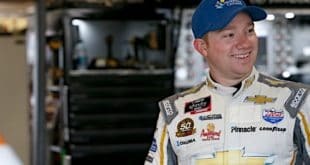 Given the relative transparency of Larson, I would not be surprised, after combing through Larson’s quotes of the past year, if a written quote by Larson existed stating he could have, but did not, race for a win at the 2017 Homestead race. A non-championship contender, Custer, won the 2017 Xfinity Homestead race, while Byron won the Xfinity championship. The Busch series or the truck series isn’t the Cup series. Different written and unwritten rules.